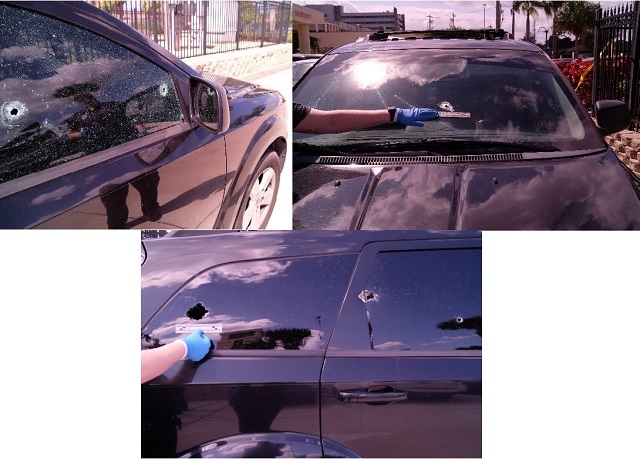 MELBOURNE, Florida - A man was shot and his car riddled with bullets on Friday morning. Just before 10 a.m., the Melbourne Police Department received a call from Holmes Regional Medical Center regarding a patient being shot. The victim, Ricardo Washington, indicated he was shot and drove himself to the emergency room. He was not initially able to provide information as to where the shooting occurred or when it had occurred. When officers arrived on scene at the hospital, they discovered that Washington's car had multiple gunshot holes. The vehicle then remained in the custody of police during processing. While processing the vehicle, Washington was released from the hospital. Washington informed police that he did not wish to pursue charges and did not know who the suspect was or how many there were. As a result of Washington’s information, police have closed the incident without an arrest at this time.